Indian Prime Minister Narendra Modi made important diplomatic advancements with Nepal. Indian Prime Minister Narendra Modi concluded a two-day state visit to Nepal on Monday. Modi, who has been praised for hitting “the right notes” in Nepal, has made India’s relations with neighboring South Asian states a priority in his foreign policy–his first trip abroad as prime minister was to Bhutan. On Sunday, the first day of the two-day visit to Nepal, Modi met with Nepalese Prime Minister Sushil Koirala and delivered a 50-minute speech before Nepal’s legislature in which he emphasized the importance of Nepal’s ongoing constitution-writing process. Modi’s speech was the first by any foreign leader before Nepal’s legislature, according to the New York Times. 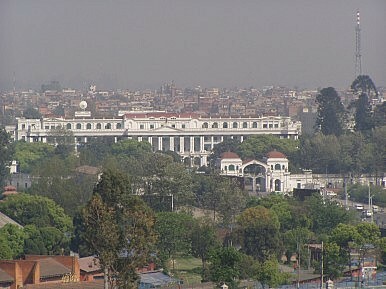 Nepal and India have close political, economic, historical, and cultural ties. Ahead of his trip to Nepal, analysts expected Modi to push for close relations between India and Nepal, primarily due to the fact that Nepal is a Hindu-majority state and members of the Bharatiya Janata Party’s (BJP) have called for closer relations with it for reasons of religious solidarity. On the contrary, Modi’s choice of words in Nepal has been carefully non-prescriptive. “My work is neither to give directive nor to interfere with your work in Nepal … because Nepal itself is a sovereign nation,” noted Modi. Modi’s visit comes at a time when Nepalis skeptical of Indian influence have come around to accepting the benefits of stronger India-Nepal ties, particularly in the field of energy. Against this backdrop, Modi is careful about being perceived as an outside influence on Nepal’s fragile constitution-writing process. India and Nepal did sign limited agreements that will see both countries work in tandem to develop hydropower projects in Nepal. Hydropower cooperation has been an untapped area with a high potential for cooperation between the two countries. According to some reports, the two sides did not reach as comprehensive of a deal as they might have hoped to due to enduring disagreements. Specifically, certain Nepali political groups oppose energy cooperation with India because they fear that India could gain exclusive rights to Nepal’s water resources. Although both the Nepali Congress and the major Maoist parties support the deal, there is still some lingering suspicion of Indian intentions. Meanwhile, for India, energy cooperation with Nepal is growing into a somewhat zero-sum game with China. Beijing is funding a 60-megawatt hydropower complex on the Trishuli river and a 750-megawatt plant on the Seti river. In addition to hydropower, the Indian side has expressed interest in revising the 1950 India-Nepal friendship treaty, the bilateral document that has both guided relations between the two countries for over two generations and been a source of controversy. Both the Indian and the Nepali sides have complained about the inherent inequality of certain clauses of the treaty, including one clause that Nepal must consult with India on its defense policies. Nepal was unable to take up earlier Indian offers to renegotiate parts of the treaty due to internal political instability but Sushil Koirala’s government will likely move ahead with negotiations. Finally, on Monday, the Indian Ministry of External Affairs stated that India will extend a $1 billion line of credit to Nepal. For India, Nepal’s transition from its Maoist-dominated days back to a constitutional democracy represents an immense opportunity and explains why Modi chose to prioritize India’s small neighbor to the north for a bilateral visit during his first hundred days in office. Modi made sure to appear non-dictatorial on Nepal’s constitutional process and instead pitched India as an important economic partner for Nepal. Modi's star has fallen in Nepal since his first visit in 2014. Can he rekindle the relationship?